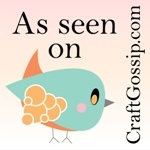 more sewing kits and some fun resources | lots of pink here! When I get an idea or a project in my head, it often times becomes somewhat of an obsession. I know I am not the only one this happens to since I read similar stories on lots of sewing blogs. This has been one of those projects!! I have had so much fun making these sewing kits and I still have a few more to make before I can really move on. I used fabrics from this bundle for this kit but there are lots of other colors to choose from too! The orange colorway is amazing! A patchwork of all of the prints would be fun too. Speaking of patchwork, that is what I did with the last one I made. I used Annie's farm stand fabrics that I got from Kerri. I made the exterior by patchworking all of the prints together. I wanted to continue the patchy look on the inside, so I used different fabrics for each pocket. That space to the right of the needle book had been bothering me. Not that space is a bad thing but I kept thinking that it would be fun to put something purely decorative there. Some hand sewing for a hand sewing kit seemed appropriate! I found this adorable collection of strawberry embroidery patterns on etsy. I used the pattern to make appliques for the strawberry part and then stitched the flower. I attached the little patch with steam a seam lite before adding the aqua running stitch around the edge. I've always loved hand embroidery, there is something so slow and homey about it. I am so glad that it is getting more popular again. I have found some really great etsy shops lately that have the most adorable hand embroidery patterns. I thought some of you might enjoy them too. wild olive has adorable patterns that are packaged in themes like back to school, happy birthday, and cute and girly. She even has a zombie one, I am sure this one had to have been made just for you Monica!!! :) Her tiny pattens would be perfect for that space on the sewing kit that I mentioned above. 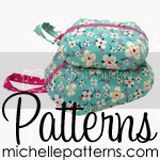 Mollie also has an adorable blog that has tons of free patterns! big B is where I got the strawberry pattern. She has lots of flowers and a really adorable gingerbread house pattern! Possibly my favorite embroidery patterns come from Tasha. Her shop is filled with the sweetest things like little red riding hood, hedgehogs (like the one tucked in the pocket in my photos), and a little bird on a mushroom. I know there are so many more!! If you have any that you love or want to share please link to them in your comment!!! I don't want you to think that these sewing kits are just for those of us that like hand embroidery though! If you like to sew bags you often have to hand stitch an opening closed. If you quilt, you have to stitch on those bindings! I think it would also make a great gift for a youngster that wants to try sewing or as a repair sewing kit for someone off to college or getting their first apartment. These are awesome, especially with the embroidery. You do that so well. I'll check out the shops. I have one more hat and a pair of socks to knit and I'll be sewing again! Your little embroidered white flower is fantastic! I love it! these are so fun!!! thanks for sharing the tutorial (it's now on my list!) and the links. Those are the sweetest little things - and the fabrics are divine. 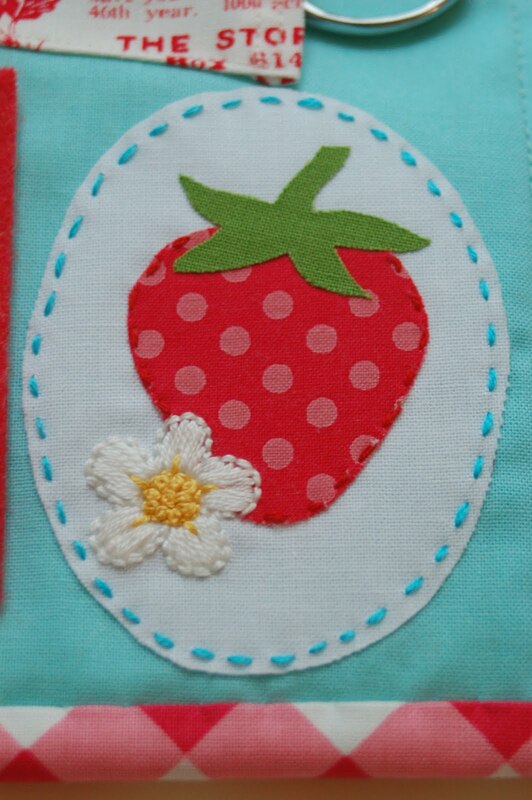 I'm in love with that strawberry patch - what a wonderful way to adapt the pattern. I must go look around at your other goodies as well. So Cute. Just found your blog, so darling. I am addicted to strawberries. Yay!! So adorable! I love the strawberry patch, and I am also quite delighted that slower crafts like needlepoint are coming back around. The amy's farm stand kit is the cutest! I love that fabric. OMG, Amy - I'm blushing and gushing! Mind you, I'm doing that while fondling my yummy gift from you!!! XXXOOO! How adorable!!! I've been meaning to make one but didn't know where to start. I'm a follower. Thanks Amy! !